I’m a licensed master’s level social worker and a few years ago, I worked at a skilled nursing facility. I knew within a few days in of starting the position, I would not work there for very long because I was not utilizing my skills. I stayed for 15 months, and in that time, I met some truly great people, staff and residents alike. It was there that I first made the chocolate peanut butter cake that resulted in people offering to pay me to make it for them. One of the coworkers that ended up paying me for the cake was one of the house cooks. After working 12 hour days, being on her feet all day, and preparing up to 25 meals for both breakfast and lunch, and cleaning up afterwards, I, too, would have little desire to spend much time in my own kitchen. Over the last couple of years, she usually orders a cake 2-3 times a year, or provides me a recipe and requests that I make it for her. And that’s the story behind this cake. If I’ve not made something before, and I’m going to be selling it, I want to know how long it takes: preparation, taste, and presentation. A trial run, if you will. She gave me the recipe and I’m set to make her one for Thanksgiving so I made it last week, tried it, shared with the family, and brought the rest into my current coworkers who ate it up. Some of their comments: “Good cake!” “It’s great!” “Yummy!” “So good with my coffee!” and my favorite, “That was so good, omg!!!! I had one last piece for breakfast today as I was lucky it was still there!” Cake, the breakfast of champions. Preheat oven to 325 degrees. Grease and flour 2 nine inch round cake pans and line the bottom with 2 circles of parchment paper, grease and flour; set aside. Sift together both flours, baking soda, baking powder, and salt; set aside. In a bowl, beat together the vegetable oil, shortening, vanilla and lemon extract. Beat well at high speed with whisk attachment until light and fluffy. Beat in the eggs one at a time. In a small bowl, add the sugar and with the back of a spoon, press the lemon zest into the sugar until fully incorporated. Add the lemon sugar to the oil/ egg mixture. Fold in the dry ingredients alternating with the buttermilk beginning and ending with the flour additions (doing three divisions of the flour and 2 of the liquid). Do not over mix the batter. As soon as it has no lumps in the batter, pour into the two prepared 9 inch cake pans. Bake at 325 degrees F for 30-35 minutes or until a wooden toothpick inserted in the center comes out clean. Allow the cake to cool in the pans for 10 minutes before turning out onto wire racks to cool completely. FOR THE FROSTING: Mix together the powdered sugar, lemon zest, and butter until it becomes sort of crumbly. Add the lemon extract and a little of the milk and beat until smooth and fluffy, adding only enough milk to bring the frosting to a creamy spreadable consistency. Fill and frost the cake. Garnish with candied lemon zest if desired. To make candied lemon zest, remove the zest with a sharp vegetable peeler in long strips, avoiding as much of the white pith as possible. Bring one cup of water and one cup of sugar to a slow boil. Add the pieces of lemon zest and boil for about 15 minutes. Drain the lemon zest on a wire rack. When cool, cut them in strips and roll in fine sugar. FOR THE CANDIED LEMON ZEST: Using a sharp vegetable peeler, remove the zest in long strips, avoiding as much of the white pith as possible. In a small saucepan, bring together a cup of water and sugar to a slow boil. Once boiling, add the lemon zest and boil for 15 minutes, stirring occasionally. In a small bowl, add the 1/2 cup of sugar. Remove the strips from the syrup and toss in the sugar, transfer to a wire rack to cool completely. 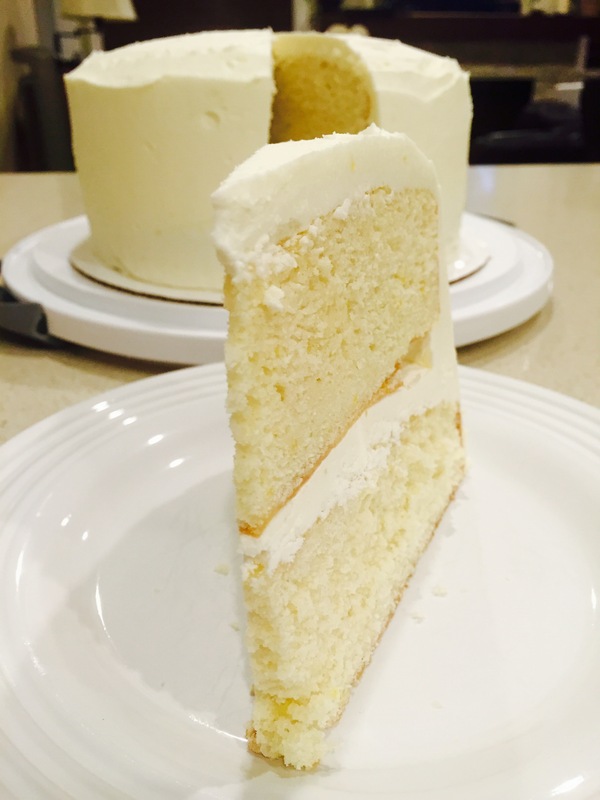 Once cool, arrange on the top of the cake, pressing slightly to secure in place.